Hello, my friends! I just wanted to show you how I organized my t-shirt stash. I used one of those wire cube shelf things that I got at Target. I ended up wiring the pieces together - that way it won't come apart on me when I pull out a shirt. Then I folded the t-shirts in half crosswise, put the sleeves inward and then rolled them up tightly. I put the shelving on a garage sale coffee table in order to increase the storage. I plan to put baskets of scraps underneath. The colors look so pretty, I hate to use them now. But this way I can see everything without rummaging through boxes. It's easy to pull one out without disturbing the others. Here is the room in my studio cottage that I have the t-shirts. Isn't that little handmade built-in cabinet great? Here are all the t-shirts - aren't they pretty? The icky shag carpet has to go - that's the plan! What creative idea have you come up with for organizing your stash and tools? That looks so PRETTY! 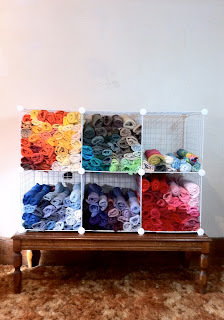 How fun when organizing ends up looking so nice.